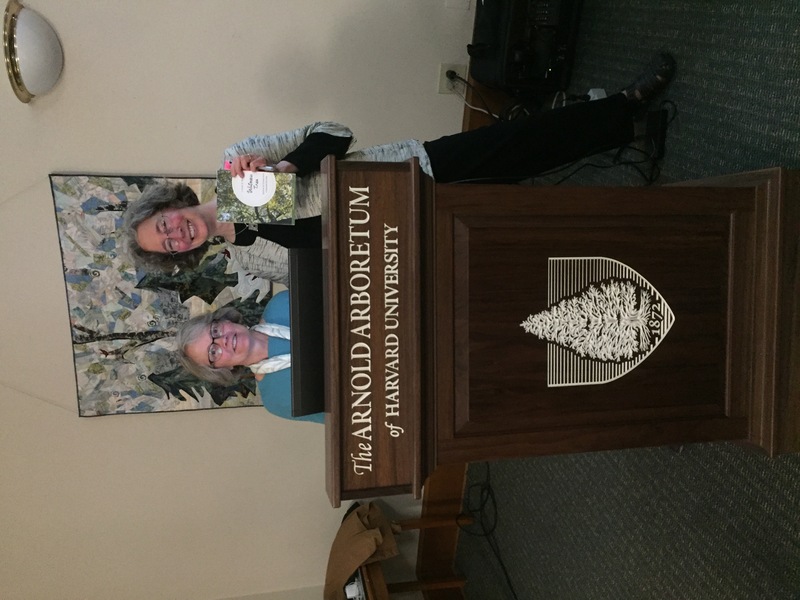 How honored I was to be the first author to present from the new lectern at the Arnold Arboretum fashioned from a walnut tree in its collection that had to be cut. The tree survived minimal hurricane damage in 1985, and a lightning strike. A shoot is now growing from the remaining stump. And its life at the arboretum continues. For one, the tree’s uniquely beautiful wood has been fashioned into a new lectern for presentations at the fine gathering space in the visitors center at the Hunnewell Building at the arboretum. Made from black walnut (Juglans nigra) by Pergola Construction of Swampscott, MA., the lectern is just one new life and purpose for the tree, accession number 14761*A, received as a plant in Dec 1893 from Thos. Meehan and Sons Nursery in Germantown, PA. I was thrilled to read at the lectern — the first presenter to have the honor — during the launch for Witness Tree so graciously hosted by the arboretum May 5. 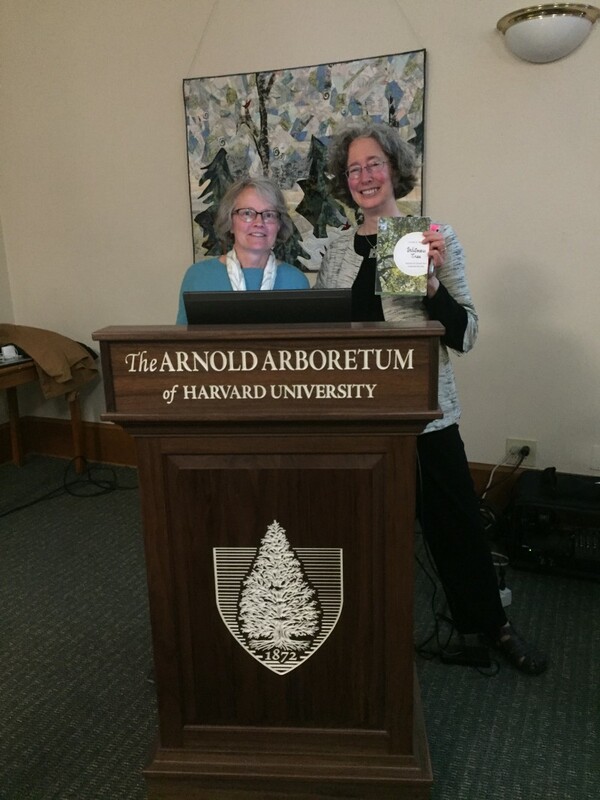 With Pam Thompson, left, manager of adult education at the Arnold Arboretum, and a copy of Witness Tree the night of the big launch, the first at the new lectern. And what beauty it is! Photo by Richard Maddocks. One of the joys about the arboretum is the history in each named, numbered and tracked tree and shrub in the collection. I think director William (Ned) Friedman knows each one as an individual. On a visit to the arboretum earlier this week the two of us roamed the rain-soaked grounds for hours and it was a joy to watch him exclaim in the wonders unfolding as spring coaxed out new leaves and flowers in profusion. No administrator stuck behind a desk, Friedman makes a point of visiting the collection, photographing it, blogging about it, and knowing the condition of the grounds and plants up close, and personally. 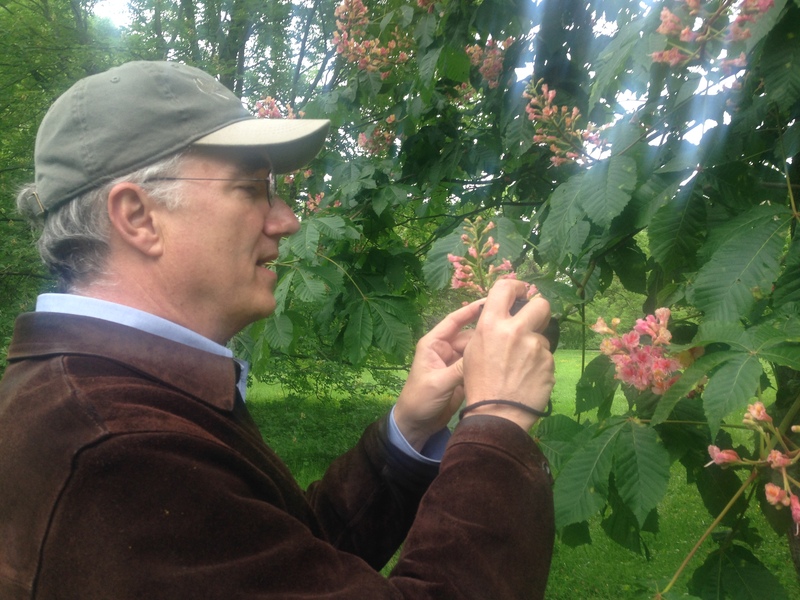 Ned Friedman, director of the Arnold Arboretum of Harvard University, savoring the bloom on a horse chestnut. The collection was in peak flower during my visit May 22nd and a sight not to be missed. But that is not the end of the story on the black walnut. When I came back to the arboretum that day after our ramble around the grounds Dr. Friedman showed me the new conference table, delivered just that day at the arboretum’s Weld Hill Research Building. What a glory that table is: silky smooth to the touch, grand, with every bit of grain and beauty revealed, it is a gift not only to the present, but the future. 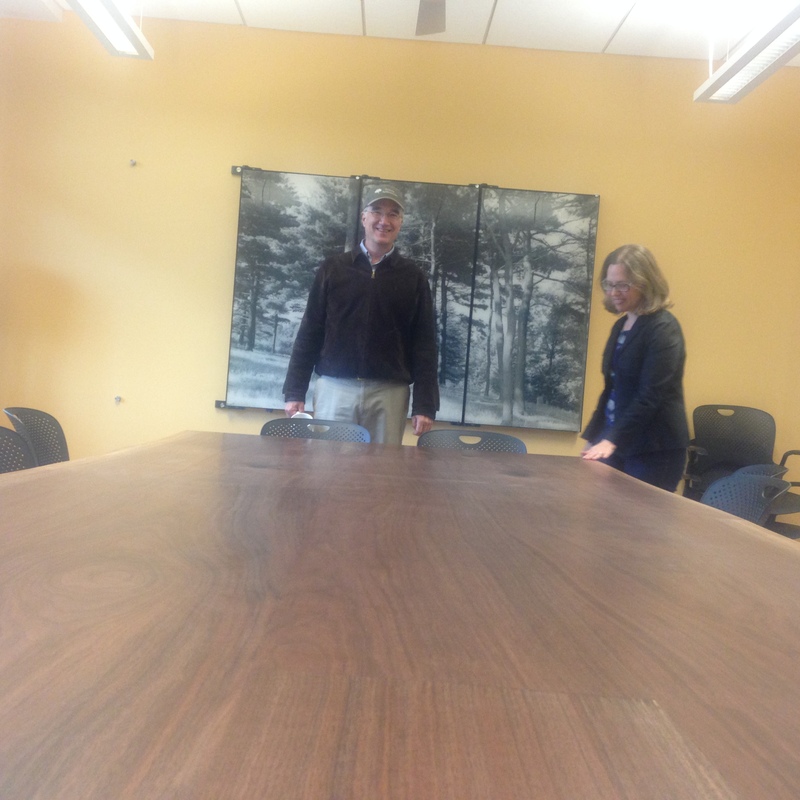 The new conference table made from the same black walnut, shown off by Ned Friedman, arboretum director, and Faye Rosin, director, research facilitation. 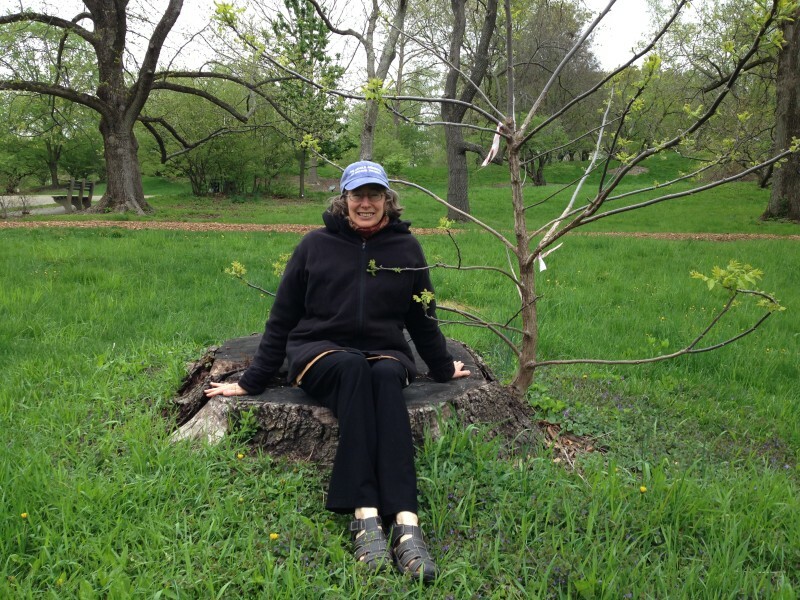 And speaking of the Arboretum…be sure to read my story about the story behind my book Witness Tree, just published in the current edition, Vol. 74, No. 4 of Arnoldia, the science magazine of the Arboretum. Thanks to editor Nancy Rose for doing such a nice job with the story.